A hot soup is just right for the season. Slight sweet taste of the carrot and onions counterbalanced by the zing of pepper. This version does not use a broth/stock, so has less cooking time but is creamy and tasty. Soak the almonds overnight. An alternate and quick way is to add boiling water to the almonds, keep them closed for 30 mins. 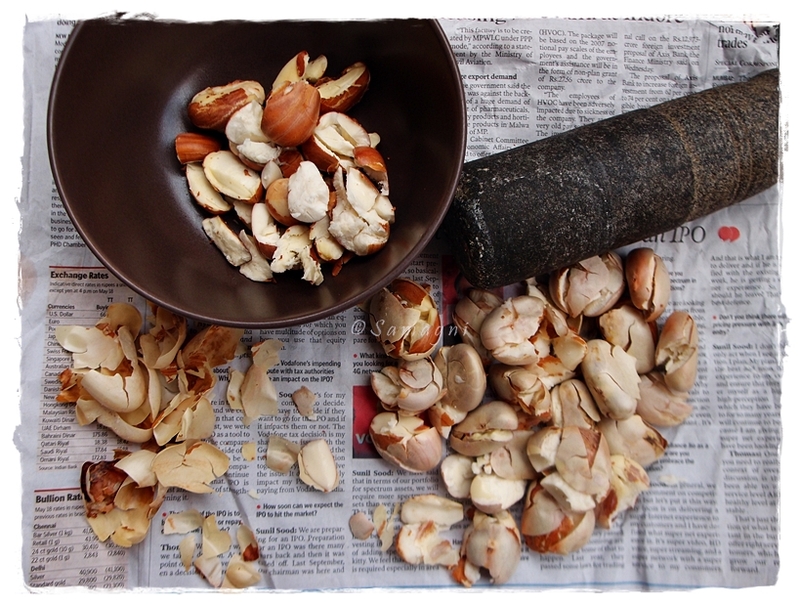 Peel them by gently holding the soaked almond in between your thumb and other fingers and nudging the peel gently. Keep aside. Wash, clean, and scrub the carrots lightly. Do not peel. Carrot peel is rich in nutrients and antioxidants. Heat oil in a vessel. Add chopped garlic and saute. When they turn pale, add chopped onion, cinnamon sticks, and cloves. When the onion turns pink, add chopped carrot. Saute for 2 mins. Add water. Close the vessel with a lid and let it cook for 10-15 mins. Discard the cinnamon stick and cloves. Let it cool. Strain the vegetables and retain the water in the vessel. Puree the carrot-onion mixture along with 15 pieces of almonds. Reserve 5 for dressing. Pour the pureed carrot-onion mixture back into the vessel containing cooked water. Let it simmer on medium heat for 5-6 mins. Add salt, crushed peppercorns, and mix well. Garnish with basil leaves and almond pieces. Serve with bread/croutons. Chaat or salad? You decide. A recipe that you can put together easily and pass on as a snack or as a salad before a full-course meal. Soak the chickpeas for about 8 hours. Sprouting the chickpeas is even better. Pressure cook the chickpeas with salt in adequate water until soft. Chop onion finely. Split the green chilly, remove the seeds, and chop finely. You could add crushed peppercorns instead of green chilly. Chop coriander leaves. Crush the cumin seeds. Extract lime juice. Add lime juice and crushed cumin seeds to olive oil to make a salad dressing. Add the finely chopped onion, green chillies, and coriander leaves to the boiled chickpeas. Add the salad dressing to this and toss to mix. Adjust salt if needed. You could add tomato and cheese to this salad. When you have to make roti subzi for just one person, what subzi do you make? Here is a simple one with very few ingredients that you can prepare in 5-7 minutes. Peel the garlic and onion. Chop garlic, onion, and tomato into small pieces. Pour oil into an iron wok. Crackle mustard seeds. Add chopped garlic. When they turn brown, add chopped onion. Saute for 2 minutes. Add turmeric powder, chili powder, coriander powder, and hing powder. Add chopped tomato. Saute for 2 more minutes. Add salt and turn off. Add grated coconut and chopped coriander leaves if preferred. Serve with roti. A nutritious kick start for the day leaves you feeling good the entire day. Pesarattu or sprouted mung bean dosa is an Andhra native. I had never tried this dosa though I had seen it on restaurant menus. My sister-in-law, a girl born and brought up in Karnataka, was recovering from a bad bout of fever for which she was on antibiotics and steroids. When I asked her what special care she took to regain good health, she told me about the mung dosa she makes. Usually pesarattu is made of soaked mung bean. She makes it with sprouted mung and adds peanuts too while grinding the batter. I tried her version of pesarattu today and I loved it. So here is the recipe. Wash and soak the mung bean in water for 8 hours or overnight. After 8 hours, drain the water and keep the wet mung beans in the same vessel for the next 24 hours. You will see sprouts coming out within 12 hours. You can keep it longer (24 hours) to get longer sprouts. Soak raw rice in water for 3-4 hours. Grind sprouted mung bean and soaked raw rice along with onion, ginger, coriander leaves, hing, jeera, green chillies, and salt to make a fine paste. Add sufficient water to the batter. Do not make it too loose. This is an instant dosa batter and does not need fermentation. Heat a griddle and spread a ladle full of batter on the griddle. Maintain medium heat. Drizzle 1/2 tsp of oil on the spread batter/dosa. When the sides of the dosa start turning brown (less than a minute), gently flip over the dosa using a spatula. Cook for less than a minute. Flip over to check if the dosa has become golden brown. Serve with chutney/sambar or milaga podi/gun powder. If you prefer a topping for this dosa, after you spread the dosa, you can sprinkle finely chopped onion and coriander or even cheese. 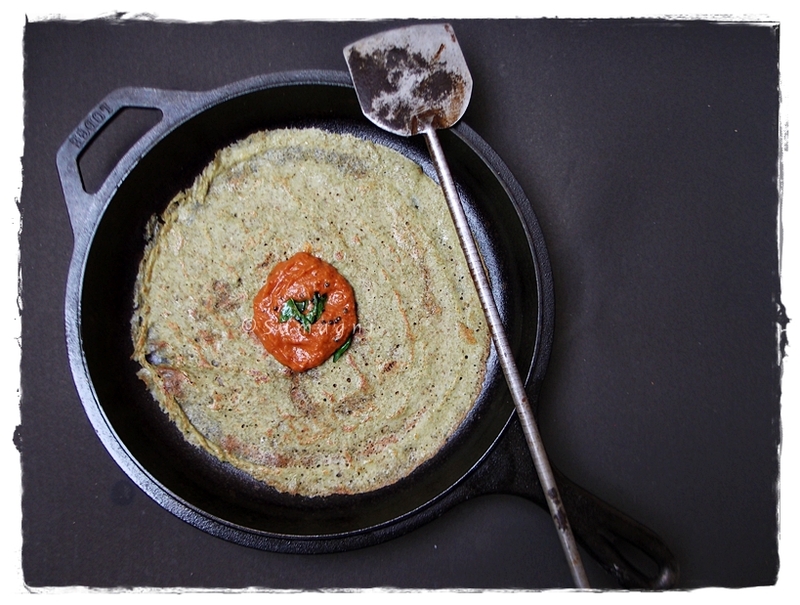 Gently spread and press the onion and coriander pieces to the dosa using a spatula. Be careful when you flip the dosa over so that these pieces do not fall off. If you are adding cheese, add shredded cheese to the dosa only after it is full cooked, just before you take it off the griddle. You can refrigerate this dosa batter for 3-4 days. I made coconut chutney spiced with green chilies and ginger to go along with this dosa. Wash the green chilies, coriander leaves, and ginger. Be careful about the amount of ginger you use. Ginger can make the chutney fiery. I am not a ginger fan. So I usually use just enough to get a hint of ginger. If you like to use more ginger, use less of green chilies. Grind all the ingredients using sufficient water. I did not do a tadka for this chutney, but if you prefer a tadka, you can heat mustard seeds and urad dal in some oil. When the mustard seeds splutter and the urad dal turns red, add curry leaves to the oil and mix well with the chutney.